Now Sergey Kirillov take a leading position among artists by quantity of publications of pictures in printing editions of The History of Russia. Since 1987 25 exhibitions of his paintings have taken place in Moscow and other towns of Russia. The works of the artist are kept in The State Tretyakov Gallery, Art Museums of Pereslavl, Bryansk, Alexandrov and other towns of Russia. Since 1991 more then 20 interviews have taken place on the television channels of Russia, Japan and USA. 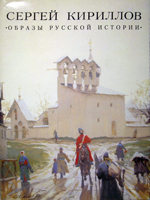 In 1996 The Album of the author’s paintings was published on the order of The Government of Russia. In 1993 for the first time in Russia a non - commercial personal Art Gallery ”Imagies of Russian History” was created in the building of VOOPiK on Derbenevskaya nab. 1/2. At present time the Gallery is closed.